We have written about a lot of herbs on this site, some of which are far better known than others. 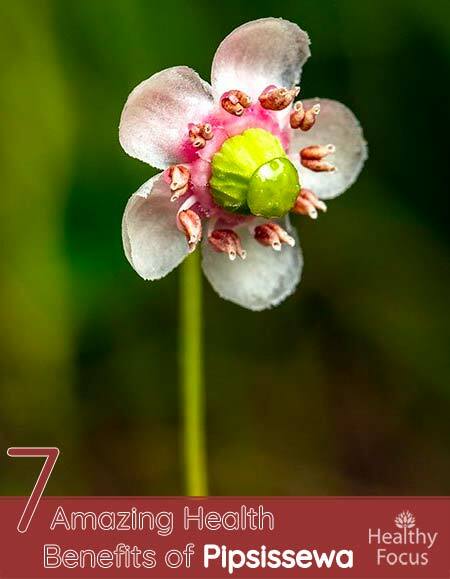 Few however will be as little known as this unusually named plant which is known scientifically as Chimaphila umbellata. The plant’s common name actually comes from the Cree Indian language and I am reliably informed means ‘broken into pieces’ because of the herb’s purported ability to help dissolve and heal kidney stones. Other names by which the herb is commonly known are king’s cure, prince’s pine, bitter wintergreen, rheumatism weed and false wintergreen. The plant has similar properties to the better known ‘bearberry’. Both contain hydroquinone as an active ingredient and both are believed to have natural diuretic effects. Pipsissewa is found growing wild in forests across North America as well as some parts of Asia and Northern Europe. The plant is small and measures around 15 to 25 centimeters in height. It has firm, leathery leaves with coarse serrated edges of around 5 to 7 centimeters in length. Each of the plant’s flower stems has a number of cup-shaped pink or white colored flowers that gather together in a beautiful display. The plant flowers from early in the summer until late in the fall. Both the leaves and the aerial parts of the plant are harvested when the plant is flowering to produce a medicinal herbal tea as well as liquid extracts and tinctures. The fresh leaves of the plants are also gathered to make poultices for external reasons. While most people in the modern world have never come across the plant, it has been used for a very long time by certain cultures including the Native Americans. It has long been valued for its varied medicinal uses including the treatment of fevers and to induce perspiration. It has also been used to treat bladder infections and kidney complaints including the treatment of kidney stones. Pipsissewa has also been put to use to deal with various respiratory complaints, heart ailments, constipation and venereal disease. It is a popular remedy when used topically on the skin and women have used it to help deal with the unwanted symptoms of menstruation and also to regulate their menstrual cycle. Settlers from Europe cottoned onto the medicinal benefits of the herb and used it for various health conditions especially kidney and urinary tract complaints and rheumatism. Pipsissewa is also known by a number of other names. these include Bitter winter, Prince’s pine, False wintergreen, Rheumatism weed, Ground holly, King’s cure and Spotted wintergreen. Hydroquinone is the main active ingredient of both Pipsissewa and bearberry which is why both plants are used for urinary tract complaints. Pipsissewa has a lower tanning content than bearberry meaning it is more suited for long term use. It can also be applied topically to treat wounds, blisters, sores and swelling. It is used as an eyewash. Historically, the plant was used by the native Americans to treat fever and fever diseases such as typhoid. They also used the plant to treat painful menstruation and for digestive troubles. The leaves have been used as a substitute for tobacco. Pipsissewa extract is sometimes used to flavor food and beverages. These days, pipsissewa is mostly used in the form of a tea infusion but can also be applied topically. Supplements and tinctures are also available. According to the US Pharmacopoeia, pipsissewa has a variety of medicinal properties. These include astringent, antiseptic, antimicrobial, anti-inflammatory, diuretic and tonic actions which give the herb a very wide range of potential uses. Although it has not been very widely studied, the historical use of the herb should not be taken lightly and pipsissewa may be a hidden gem. The plant contains a number of medicinal compounds including flavonoids, triterpenes, hydroquinones and tannins. Chances are that it is growing very near to you and the opportunity to make use of this natural healer should not be wasted. Pipsissewa has similar diuretic effects to bearberry or urva ursi but because it has a lower tannin content, it is deemed to be a safer option to take long term. Although there is no research to back up its use for the kidney, pipsissewa has long been valued by the native Americans. They have long drunk it as a herbal tea as a form of natural diuretic to help deal with kidney complaints and bladder complications. According to traditional use, pipsissewa helps a person’s body excrete excess fluids and waste by stimulating urinary flow and improving liver function. Because of the herb’s antibacterial and antiseptic nature, it has also been used to treat conditions like cystitis and gonorrhea. According to research into the health benefits of pipsissewa, the herb contains powerful antioxidant effects that have a wide range of medicinal uses. (1) Antioxidants play a vital role in protecting the body from illness caused by free radical damage so getting plenty of them into your system is vital. Pipsissewa could help minimize the risk of heart disease, cancer and even help to expedite wound healing according to researchers. A poultice made from pipsissewa has traditionally been used to deal with painful conditions of the joints or bones. According to proponents of the herb and traditional uses, conditions like rheumatism, arthritis and gout can all be treated effectively by applying the herb directly to the affected area of the body. The herb also has mild pain killing properties when applied directly to the skin. To treat joint pain and inflammation, you can rub the leaves directly into your skin or make a poultice with the leaves. The leaves should not be taken internally. Because of its diuretic qualities, pipsissewa may be useful in promoting sweating and to help break a fever. Indeed, the native Americans have long drunk a tea made from the herb to help reduce fevers. Another potential use of pipsissewa is to treat some of those annoying conditions of the respiratory tract. Whether you have a cough, chest congestion or a sinus infection, drinking a hot cup of pipsissewa tea may really do the trick. As you drink the tea, inhale the steam from your cup and it may help clear the nasal passages and sinuses helping you to breathe more comfortably. It is also possible to apply pipsissewa topically either in the form of a poultice or simply applying a solution made with the leaves directly to the skin. It has been used traditionally to treat blisters, boils and minor wounds. It has also been applied topically to treat swelling in the legs and feet and to ease backaches. As we have already mentioned, it can also be used for rheumatism and may even help when it comes to treating a painful gout flare-up. Drinking pipsissewa tea may help relax your mind and calm down during periods of moderate stress. Although there is no scientific evidence of its effects on stress, many teas have a calming effect on people and according to anecdotal evidence, pipsissewa may help. To make a cup of calming pipsissewa tea, follow the simple instructions below. Pipsissewa has traditionally been used to make a herbal tea or infusion but it can also be applied externally in the form of a poultice. Drinking the tea can help relieve urinary tract and kidney infections while it may also help ease your breathing or break a fever. A poultice made from the herb is especially useful to treat minor wounds, burns, grazes and bug bites and can help prevent infection from taking hold. You should however only use the leaves if you are making a poultice for external use. To make a medicinal tea with pipsissewa, simply follow these very easy steps. Take a teaspoon of dried and crushed pipsissewa leaves and place in a cup of boiled water. Allow the leaves to steep for at least 15 minutes. When the liquid is sufficiently cool, strain the leaves. Add honey to taste if necessary and drink up. You can safely drink two cups of this tea each day. What is pipsissewa good for? Pipsissewa is a little know herb that has a good range of medicinal uses. It can be used to treat wounds, swollen joints and rheumatism and may help improve respiration. Because of its hydroquinone content, pipsissewa is also used to treat urinary tract infections while its diuretic properties may help calm down a fever. How is pipsissewa usually used? Pipsissewa is most often drunk in the form of a tea to help treat internal conditions like kidney complaints or urinary tract infections. It can also be applied topically as part of a poultice to to treat wounds, burns, sores and bites. Can I get pipsissewa in supplementary form? Yes, pipsissewa is also available in several supplementary forms including capsules and tinctures. Pipsissewa contains a compound called hydroquinone which is known to be toxic when taken in a high dose. Large doses can cause a range of symptoms including nausea, vomiting, dizziness and diarrhea. Using pipsissewa long term is not recommended. Pipsissewa can cause the urine to turn green and while this may cause some alarm, it is not considered to be dangerous. The tannin content of the herb can hinder the absorption of certain medications so it should only be taken several hours before or after any other medication. There is insufficient data regarding the safety of pipsissewa in pregnant and breast feeding women. It should probably be avoided unless you are told otherwise by a qualified herbalist or doctor. There are some reports of pipsissewa causing a rash in rare cases. Pipsissewa is not a very well-known herb but the Native Americans have been aware of its benefits for a very long time. It has a number of potential medicinal uses. Studies have showed that the plant has antioxidant and anti-fungal potential while its hydroquinone content makes it useful in treating kidney and urinary tract infections. Have you ever used pipsissewa and what did you think of its effects? Please let us know in the comments section below. We would be very happy to hear from you.